While not one of the early settlers of Portland or one of the men instrumental in giving the city its first impetus, James Boyce Montgomery, for whom Montgomery street and Montgomery drive are named, was a vital factor when Portland was just beginning her larger growth. Born in Pennsylvania December 6, 1832, he went to school until the age of 16 and then took up the topographical art. This pursuit was short lived however and he became a builder of railroads and bridges, constructing several important routes in the east and also as far west as Denver. In 1870 he came to the Pacific coast and in 1871 to Oregon. Upon his arrival he offered to build the first portion of the Pacific division of the Northern Pacific railroad and secured the contract. He built over 100 miles of this road and also erected the drawbridge over the Willamette river at Harrisburg for the Oregon & California railroad. 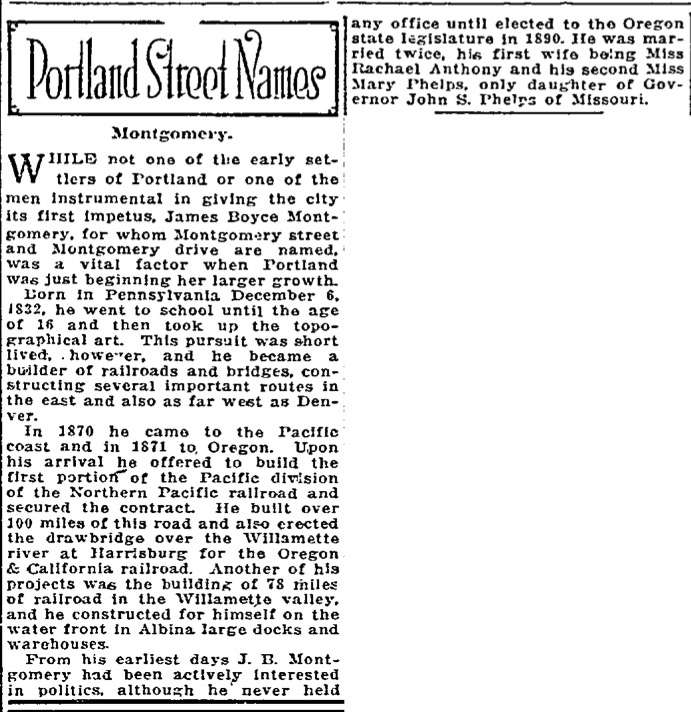 Another of his projects was the building of 78 miles of railroad in the Willamette valley, and he constructed for himself on the water front in Albina large docks and warehouses. From his earliest days J. B. Montgomery had been actively interested in politics, although he never held any office until elected to the Oregon state legislature in 1890. He was married twice, his first wife being Miss Rachel Anthony and his second Miss Mary Phelps, only daughter of Governor John S. Phelps of Missouri.